It seems incredible in hindsight but in the early 1960s, the Kalamazoo factory, home to both Epiphone and Gibson instruments, ceased production of the Les Paul guitar and in its place, created the "SG" design. And as it so often does, changes in guitar design also influenced bass design, too. With the Les Paul (temporarily) out of the picture, the SG took over. And for a time during that golden era, the classic SG bass was the historic factory’s sole electric bass offering. But the EB-0 “SG” bass was by no means a cast-off. 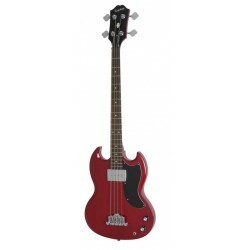 It quickly became one of the most attractive basses of the day and players like Bill Wyman of The Rolling Stones, Cream’s Jack Bruce and The Who’s John Entwistle made the "EB" style bass a hitmaker. Now, Epiphone presents the EB-0, a stunning recreation of the vintage marvel that has the tone and feel of the original without the vintage price tag and vintage problems. The Epiphone EB-0 comes with Epiphone’s Limited Lifetime Warranty and Gibson 24/7/365 customer service. Visit your Authorized Epiphone dealer today and discover the sound of a legend with the EB-0 bass.